An informal term referring to a species that might be in need of conservation action. 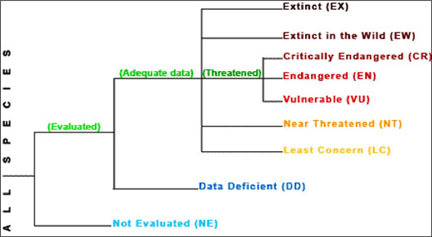 This may range from a need for periodic monitoring of populations and threats to the species and its habitat, to the necessity for listing as threatened or endangered. Such species receive no legal protection and use of the term does not necessarily imply that a species will eventually be proposed for listing. An animal or plant species likely to become endangered within the foreseeable future throughout all or a significant portion of its range. Any animal or plant species which is in danger of extinction throughout a significant portion of its range. Endangered Species Preservation Act (1966): Established in the United States to protect species facing possible extinction. Addresses only native species and protection is limited. Endangered Species Conservation Act (1969): Composed by the Departments of the Interior, Agriculture, & Defense to prevent mass extinctions of certain species. The use of endangered species by humans for food, fur, and other commercial uses was outlawed by this act and by the Marine Mammal Protection Act of 1972. Marine Mammal Protection Act (1972): USA law that outlawed the use of endangered marine mammal species by humans for food, fur, and other commercial uses. Also stipulated that a species can be defined as “depleted”, meaning that its population numbers have dropped lower than the optimum sustainable population (OSP). The OSP is determined by whether the animals are reproducing in a healthy number that corresponds to the carrying capacity of the environment. Marine animals considered depleted are the North Atlantic Coastal bottlenose dolphin, the Eastern spinner dolphin, North Pacific fur seal, Northeastern spotted dolphins, and the Cook Inlet beluga whale. Convention on International Trade in Endangered Species (CITES) of Wild Fauna and Flora (1973): Developed to regulate or prohibit international commerce of plant and animal species believed to be harmed by or that may be harmed by international trade. The authority to implement this is under section 8 of the Endangered Species Act. The Endangered Species Act (1973): USA law that is intended to provide a means to conserve the ecosystems upon which endangered and threatened species depend and provide programs for the conservation of those species, thus preventing extinction of plants and animals. The law is administered by Interior Department's Fish and Wildlife Service (http://www.fws.gov/) and Commerce Department''s National Oceanic and Atmospheric Administration Fisheries Service (http://www.nmfs.noaa.gov/), depending on the species. International Union for Conservation of Nature and Natural Resources (IUCN): Headquartered in Gland, Switzerland, the IUCN provides general conservation categories of extinct, extinct in the wild, critical or critically endangered, endangered, vulnerable and secure, or low risk for different species throughout the world. The IUCN Red List (http://www.iucnredlist.org/) provides a general conservation status for different species and indicates how many exist, an increase or decrease in numbers, how well they are reproducing, and if the population faces potential threats. The regulatory agencies, information and terminology provided are based primarily upon United States laws, however this page is still in development. 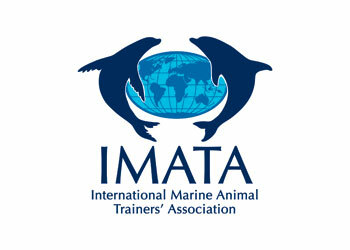 Suggestions for regulatory information from other countries are requested and should be sent to ResearchConservation@imata.org. Adults weigh ~ 181 metric tonnes and are ~33 m length. Calves weigh ~ 2.5 tonnes and are ~ 7 m in length. Filter feed through large baleen plates. Primarily consume krill and some copepods. Can eat up to 40 million krill/day. Females sexually mature ~ 5 years of age and males at ~8-10 years. Males typically breed with multiple females. Gestation is ~ 10-12 months. Births usually take place in the early winter. Can reach speeds of 50 km/h but typically travel 20 km/h. Have a huge lung capacity that allows them to stay below the surface for up to 20 minutes. Typically dive to depths of 100 m to feed. Have a thick blubber layer to assist in thermoregulation. Adults weigh ~ 136 metric tonnes and are ~20 m length. Calves weigh ~ 1000 kg and are ~ 4.5 m in length. Females sexually mature ~ 10-15 years of age. Gestation is ~ 13-14 months. Births usually take place between March-August. Use their bony skulls to break though 60 cm of ice. Can reach speeds of 16-19.5 km/h. Have a huge lung capacity that allows them to stay below the surface for up to 60 minutes. Able to dive to depths of 155 m to feed. Adult males weigh ~ 188 kg and are 2.2 m in length; females weigh ~ 49 kg and are ~ 1.5 m in length. Primarily consume squid and fish. 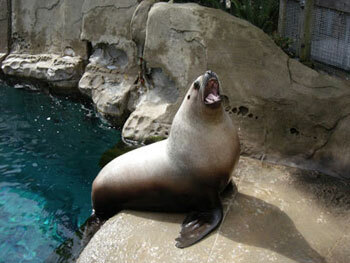 Little is known about the life history of the Guadalupe fur seal. Males protect individual territories from June-August and mate with females who arrive in their territory give birth shortly thereafter. Feed at night and dive to an average depth of 17 m.
Can stay underwater for 2.5 minutes. Travel roundtrip distances of 704-4092 km to feed. 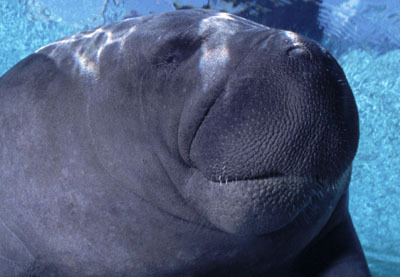 Adult males weigh between 300-400 lbs and are 7 ft in length; females weigh 400-600 lbs and are 8 ft in length. Pups typically weigh between 30-40 lbs and are 40 inches in length. Primarily consume spiny lobster, eels, flatfish, scorpenids, larval fishes, and octopus. May eat as much as ten percent of their body weight in a day. Can spend days at sea before returning to the islands where they sleep and digest their food. Females can be killed when males “mob” around her to mate and reach sexual maturity around 6 years of age. Gestation is ~ 12 months. Births usually take place between March and June. Are able to dive to depths of 1,781 feet. Able to spend long periods of time at sea. Molt hair and upper layer of skin annually. Adults are estimated to weigh 70,000 kg and range from 19-20 m in length. Primarily consume small schooling fish, squid and crustaceans including mysids and krill. Females sexually mature between ~ 3-12 years of age. Gestation varies from 11-12 months. Can consume ~ 1,800 kg of food/day. Can reach speeds of 37 km/h but typically travels at 11 km/h. Able to dive to depths of 200 m to feed. Adults weigh ~36 kg and range from 12-16 m in length. Calves weigh ~1.8 tonnes and are ~6-1 m in length. Filter feed through large baleen plates only in the summer in polar waters. Lives off fat reserves during winter. Primarily consume krill and small schooling fish. Females sexually mature ~ 5 years of age and males at ~7 years. 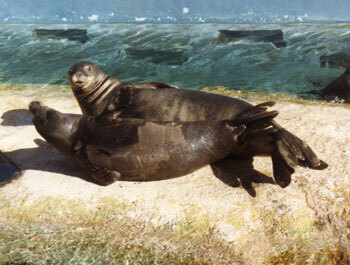 Mating and births usually take place in tropical or sub-tropical waters in the winter. Migrate up to 25,000 km annually. Humpbacks work together to create bubble nets which encircle schools of fish to ease feeding. Males annually produce a complex song that can last 10-20 minutes in duration. Adult males weigh ~6 tonnes and are ~9.5 m in length; females weigh about 5 tonnes and are ~8.5 m in length. Calves weigh ~ 180 kg and are ~ 2.4 m in length. Primarily consume salmon and other fish. Females sexually mature ~ 14-15 years of age and males at ~12-14 years. Gestation varies from 16-17 months. Calf mortality is high (40%). Can reach speeds of 56 km/h but typically travels at 11 km/h. Adults typically weigh between 14 and 45 kg and range from 1-1.5 m in length. Pups typically weigh between 1.4 to 2.3 kg. Primarily consume mollusks, urchins and crustaceans. Will engage the use of tools (rocks as hammers & anvils) to open the shells. Females sexually mature ~ 3-4 years of age and males at ~5 years. Males typically breed with multiple females but temporary pair-bonding occurs for a several days while the female is in estrus. Gestation varies from 4-12 months as the species is capable of delayed implantation followed by four months of pregnancy. Births usually take place in the water and peak between May and June. Twins occur in ~2% of births however, usually only one pup survives. Pup mortality is high, particularly during the first winter. Juveniles are typically independent at six to eight months. They lack blubber but have an extremely thick coat of fur with up to 150 thousand strands of hair per square centimeter (nearly one million per sq in) which consists of long waterproof guard hairs and short underfur to limit heat loss. 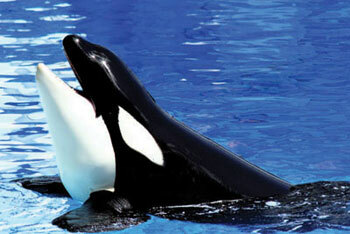 Their lungs have 2.5 times the capacity of similarly sized land mammals to aide in buoyancy and diving. Their vibrissae are sensitive and used to sense vibrations in the water and to find prey. Adult males weigh ~300–600 kg and measure 2.4–3 m in length; females weigh ~ 150-300 kg and measure 1.8–2.4 m.
Newborn cubs typically weigh less than 0.9 kg. Carnivorous. 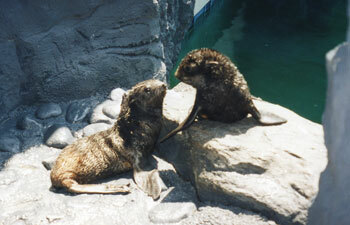 Prey heavily on seals, primarily ringed seals (Phoca hispida) and bearded seals (Erignathus barbatus). Females sexually mature ~ 4-5 years of age and males at ~6-8 years. Males typically breed with multiple females but temporary pair-bonding occurs for ~ 1 week while the female is in estrus. The fertilized egg remains in a suspended state until August or September while the female eats huge amounts of food to gain at least 200 kg and digs a maternity den. Cubs are born blind and covered with a light down fur between November and February. Each litter typically has two cubs and the mother will remain in the den until February-April. Nursing lasts ~ 1.5-2.5 years. Polar bear feet are large and made to distribute their weight load when walking on snow or thin ice and to provide propulsion when swimming. 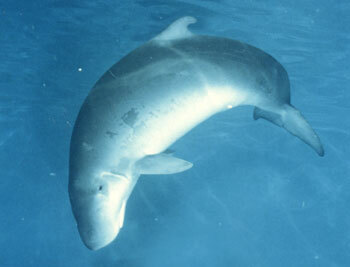 They are excellent swimmers and have been seen in open Arctic waters as far as 97 km from land. Their fur consists of a layer of dense underfur and an outer layer of 5–15 cm translucent guard hairs. They have a ~12 cm layer of fat to aide in buoyancy and help with insulation. They are well insulated by a ~10 cm layer of blubber and can overheat at temperatures above 10 °C. 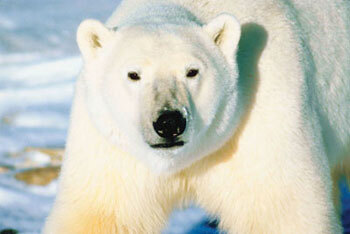 They have a well-developed sense of smell and can detect prey from 1.6 km away and buried under 0.91 m of snow. Adults typically weigh between 60-80 tonnes and range from 11-18 m in length. Calves weigh ~1 tonne and are 4-6 m in length. Primarily consume zooplankton and tiny crustaceans such as copepods, as well as krill, and pteropods. Females sexually mature between ~ 6-12 years of age and breed every 3-5 years. Mating and births usually take place in the winter months. Slow swimmers only reaching a top speed of 9 km/h. Adults weigh ~45 tonnes and are ~20 m in length. Calves typically measure 4-5 m in length. Primarily consume krill copepods and other zooplankton. Gestation varies from 10-12 months. 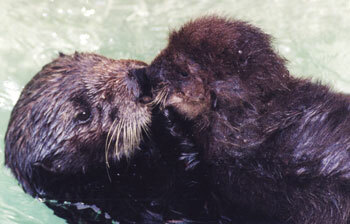 Mating and birth usually takes place in temperate subtropical waters during the winter. Annually migrate from cool sub-polar waters in the summer to temperate and subtropical waters in the winter. Have a blubber layer to assist in thermoregulation. Can reach speeds of 50 km/h for short distances. Not a deep diver and can only remain submerged for 5-15 minutes. Births usually take place in the water and peak between January-March. Adult males weigh ~50,000 kg and range 16-18 m in length; females weigh ~25,000 kg and range between 12-14 m in length. Calves typically weigh ~1,000 kg and are ~ 4 m in length. Primarily consume giant squid, octopus and fish. Females reach sexual maturity between ~7-13 years of age and give birth every 4-6 years. Males reach sexual maturity at ~ 10 years of age but do not actually breed until their late 20’s. Females are very social and reside in groups of~ 12 other females with their young. Gestation varies from 12-18 months. Can dive to depths of 2,200 m and is the deepest diving mammal of the world. Can remain under water for 90 minutes but typically remain there for 30-45 minutes. Have a large amount of spermaceti (semi-liquid waxy substance) in the head that may assist with deep diving and buoyancy control. Adult males weigh ~ 600-1100 kg and are ~2.8-3.3 m in length; females weigh ~ 300 kg and are ~2.5 m in length. Adult males have wider chests and necks and have broader and higher foreheads than females. Pups weigh ~23 kg and are ~1.2-1.4 m in length. Prey on a wide range of fish and cephalopod species. Females sexually mature ~ 3-6 years of age and males at ~8-10 years. Males protect individual territories from May-July and mate with females who arrive in their territory give birth shortly thereafter. Females have delayed implantation so that the fertilized egg does not begin to develop until October. Can live move in water and on land. Facial vibrissae are very sensitive and help find prey. Reproductive males are able to fast throughout the entire reproductive season. 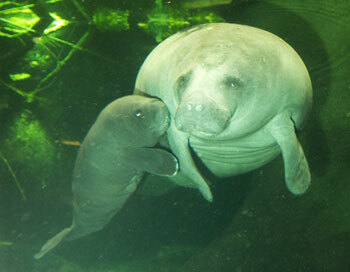 Adults weigh ~ 400-600 kg and are ~3-4.5 m in length. Calves weigh ~30 kg and are ~1.2-1.4 m in length. Vegetarian. Consume 9 to 30 kg of sea grasses vegetation daily. Females sexually mature ~ 5 years of age and males at ~9 years. Males breed with multiple females. Twins are rare calves are born about every 2-5 years. Can live in and consume vegetation in both saltwater and freshwater habitats. Lungs extend the length of the animal's body and may aid in controlling buoyancy and receiving sounds. Vibrissae are sparsely distributed over the entire body and may play a sensory role. Facial vibrissae are extremely sensitive, similar to that of the human index finger. Are able to localize sounds underwater.